April 1, 2019, Pensacola, Fla.—Want to experience the Blues from an all-new vantage point? 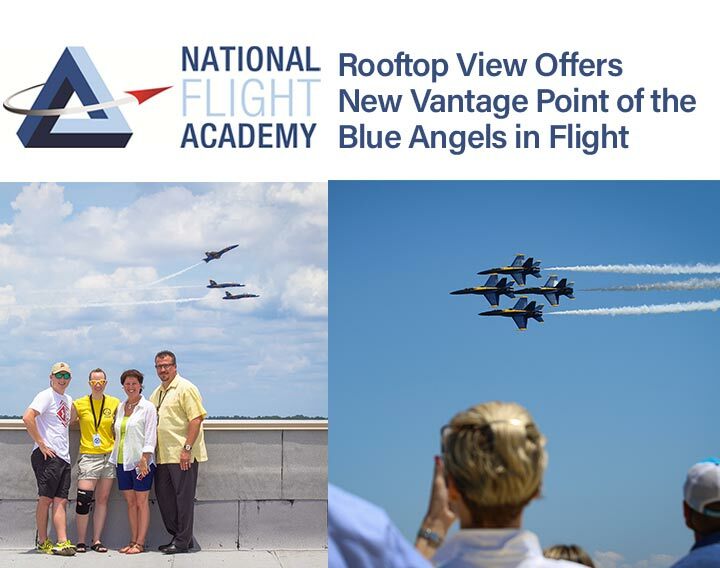 The National Flight Academy (NFA) is now offering rooftop viewing packages during the U.S. Navy Blue Angels practices most Tuesdays and Wednesdays this spring through fall. A maximum of 43 total tickets are available each fly date, regardless of package type. Please note that if any fly date has fewer than five tickets sold, the viewing will be cancelled and refunds will be given. Tickets are available at the Naval Aviation Museum Giant Screen Theater Ticket Counter inside the Museum. Tickets may be purchased up to 11 a.m. on each fly date. Visitors will take an elevator to 4th floor and will be required to take one flight of stairs to access the NFA rooftop. High-heeled shoes are not permitted on the NFA roof. Price of the ticket will include Blue Angel practice viewing, seating and a bottle of water. Price of the ticket will include Blue Angel practice viewing, seating, lunch including a Chick-fil-A sandwich, bag of chips and two bottles of water. Price of the ticket will include Blue Angel practice viewing, seating, lunch including a Chick-fil-A sandwich, bag of chips and two bottles of water. Plus an exclusive experience to fly the F-35 in the NFA simulators for 45 minutes. Delta tickets are only available when no students are onboard. For more information or to check the practice schedule and Delta blackout dates, click here.